From the moment we met up with Rani and Veraaj we knew that we were in for a treat shooting their wedding. Both Rani and Veraaj have this calming yet charming way about them that makes everyone want to be their friend! Being a little sister is something that I hold near and dear to my heart because that’s me too! I am the youngest all the way around on my side and the hubby’s side so I know how special it can be to be the youngest. On the other hand to be the youngest and getting married that is a treasure in itself as you have some of the most amazing stories to share from your parents and your siblings alike, I would not trade it for the world. When I received the call from Nikul that he and his Dad would be delighted to have us photograph yet another family event it melted our hearts to know that not only did we photograph Nikul’s wedding but his wife Smita’s sisters wedding as well Santhi, After all she started the chain and we cannot be any more thankful to her for bringing us into the family and sharing our talent with her sister’s! It was a beautiful weekend for a pithi/haaldi in Yardley Pennsylvania followed by a lovely intimate affair at the Franklin Institute in Philadelphia. We were treated with such hospitality from the Patel’s and partied alongside of them in style as they rocked the night away on Saturday. 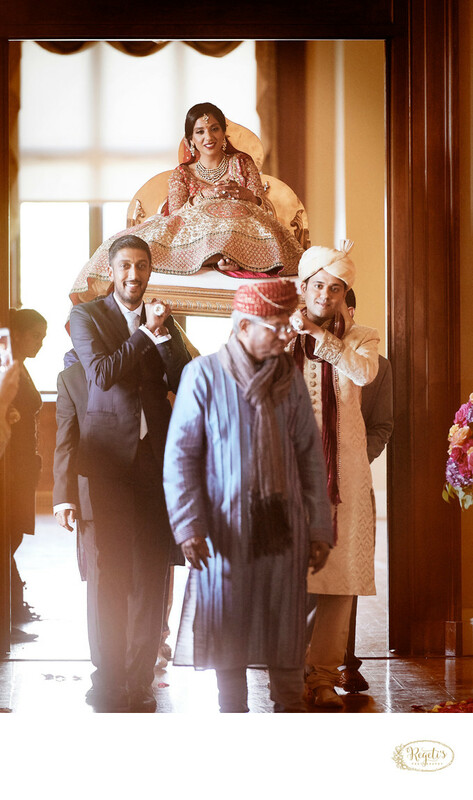 We hope that Rani and Veraaj are blessed year after year as they embark on such an amazing journey as husband and wife, we would not trade it for the world. Married life is truly where all the fun begins! Location: 317 Chestnut Street Philadelphia, Pennsylvania. Keywords: Indian Bride (12), Maharani (3).